The underlying goal of AIMS at FAO of the UN team is to raise awareness and promote knowledge about information management strategies, good practices, technologies and capacity development activities on Information and Data Access Services, in particular those surrounding the AGORA, AGROVOC and AGRIS services. Apart from raising awareness of different initiatives around open access, open data and open science in the agricultural and related sectors, the AIMS at FAO team has also been actively collaborating with the FAO e-Agriculture Community of Practice (2018: a remarkable year for e-Agriculture). the portal had 313,000 visits per page/session (with a total of 160,670 sessions). 1. AGORA : Access to Global Online Research in Agriculture service provides free or low-cost access to peer-reviewed journals and e- books to more than 3,400 institutions from more than 115 eligible countries. 2. AGROVOC multilingual Thesaurus covers all areas of interest of the Food and Agriculture Organization of the United Nations, including food, nutrition, agriculture, fisheries, forestry and environment. 3. AGRIS: Agricultural Science and Technology service provides free access to bibliographic information on agricultural science and technology. 1. Extended cross-country work focused on the development capacity in access and use of the AGORA Research4Life programme, which has reached different FAO member states, - with over 3,000 participants attending both face-to-face workshops and online AGORA training, while 450 new institutions have been registered to the AGORA programme. We are pleased to inform you that CALL for APPLICATIONS for the free AGORA ONLINE COURSE February 2019 Edition (in English, Spain, French) is now open! The course (in each language) lasts for two-weeks and requires a six-hour time commitment on average per week. Interested? Enrol to this course right now! In 2018 GOALI (Global Online Access to Legal Information) - a new fifth programme under the Research4Life (R4L) umbrella - was launched. GOALI seeks to address the growing demand for access to data, information and knowledge provided by academic legal resources. 3. AGRIS has reached 9,600,000 bibliographic records contributed by more than 400 Data Providers from up to 145 countries and is accessed by up to 600,000 users per month. A set of encoding strategies for producing Linked Open Data (LOD)-enabled bibliographic data (LODE-BD). Take a look at how you can index the concept/topic/subject/category of a resource with the AGROVOC Linked Open Data thesaurus. Meaningful Bibliographic Metadata (M2B), a set of recommendations for content providers to select appropriate metadata properties for the creation, management and exchange of meaningful bibliographic information. Global Agricultural Concept Scheme (GACS) that includes interoperable concepts from the AGOVOC Thesaurus, the CAB Thesaurus and the NAL Thesaurus. VEST Registry evolved into the GODAN Action / AgroPortal map of vocabularies for the exchange of data in the field of food and agriculture in a standardized/harmonized way. The VEST online map of data vocabularies/standards contains a number of standard vocabularies used in the agrifood sector, while several agreements for vocabularies and other tools that currently exist in the agrifood and related sectors, often overlap in their content which makes them difficult to reuse. You are invited to get more information support related to existing community agreements created to manage agricultural information by sending your questions to GODAN Data Publication Online Help Desk. All replies will be provided by GODAN partners and experts. To further support GODAN in promoting its activities, the AIMS at FAO team has helped develop and facilitate the online training course on Open Data Management in Agriculture, Nutrition and Land, under the DFID funded project GODAN Action. In 2018, six course editions (including blended learning that combines online training and face-to-face activities) were delivered to up to 5,000 people around the world. As part of the outreach activities supported by the GODAN Action in the context of open data, a series of webinars on publication and use of open data were delivered, with more than 3,000 views. Efforts will continue, in 2019, to expand promotion of AIMS. FAO information services and capacity development activities, and better coordination is planned in-house through the promotion of implementation of open data in agriculture by external partners. 2. The Interest Group on Agricultural Data (IGAD), one of the Research Data Alliance’s most prominent Thematic Groups. Since 2013, the IGAD community (presented by people from over 170 institutions worldwide) has worked on issues related to producing, aggregating, managing, consuming global agriculture data, with the main objective to consolidate agriculture data interoperability and sharing of open and FAIR (findable, accessible, interoperable and reusable) data. You might be interested in taking a look at outcomes from the IGAD RDA's 12th and IGAD RDA's 11th pre-meetings that took part in Botswana/Gaborone (November 2018) and in Germany/Berlin (March 2018). If you are planning a meeting in 2019, organize it in conjunction with Research Data Alliance (RDA) Plenary 13th, April 2019 Philadelphia, Pennsylvania! This will provide an excellent opportunity to enhance your data-driven ideas through new collaborations! This will provide an excellent opportunity to showcase your agriculture data-related work as well as create new synergies with other data experts at the international level! look forward to continue working closely together in the new established IGAD Capacity Development Working Group. After having identified training gaps in agricultural science, this IGAD group aims at creating synergies among existing capacity development activities and producing customer-centred recommendations for new training activities. The alignment with Curriculum on Open Data and Research Data management in agriculture and nutrition and Open Up Guide for Agriculture will be ensured to guide, assess and provide evidence in support of quality of different open data management programmes and services through timely mainstreamed knowledge to play a strong catalytic and supporting role in empowering all interested parties. Enhanced skills could be applied towards meaningful outcomes in leveraging the agricultural (research) data ecosystem more effectively. We will be glad to consider the opportunity to cooperate with you to widely showcase your ideas to our IGAD members and users, consortia lead organizations, and the wider research community which is incredibly important to us! Our joint initiatives give you an idea of what we have achieved this year with our renewed focus on the priority issues of advancing capacity development, leveraging open (research) data management for productivity, innovations and resilience and promoting smart farming practices and solutions. We’re lucky to have such a diverse and engaged global community and we appreciate all the feedback you share with us as well as your proposals for cooperation and coordination linked the above mentioned AIMS at FAO efforts. As 2018 is coming to a close, we want to take this time to thank you for following AIMS at FAO activities, by also giving us the privilege of helping you to achieve (some of) your goals! AIMS at FAO values of integrity, multinational teamwork, community involvement, personal growth, responsiveness, quality, and communication, which is what makes us who we are. We could not be prouder to be surrounded by our community members who embody those values. AIMS at FAO’s success is defined by the knowledge shared and success achieved by our users. Our biggest achievements from the past year are thanks to You! In 2018, the AIMS at FAO Team led to numerous exciting initiatives, thanks to your dedication, ingenuity, commitment and desire to work together. 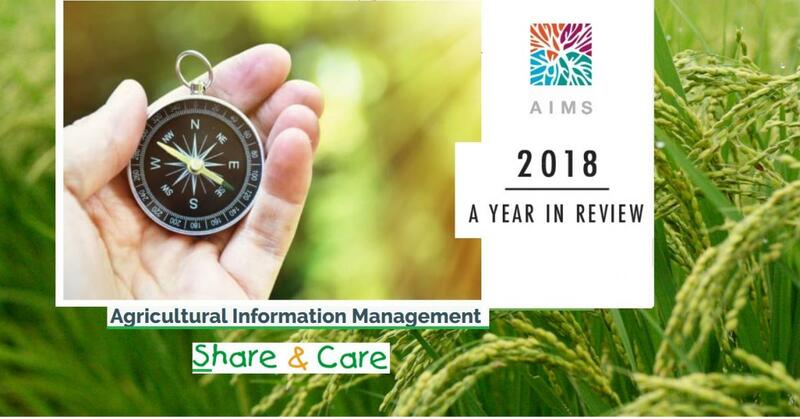 As AIMS.FAO moves into its next phase in 2019, we plan to work more closely with You, help support your priorities and more simply, accompany You to the next level of success in agricultural information and data management and access. You are welcome to sign up for AIMS News, follow @AIMS_Community on Twitter. Our biggest achievements from the past year are thanks to You!